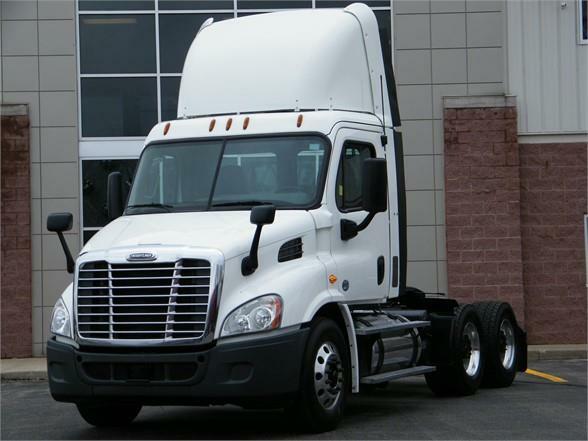 2014 FREIGHTLINER CASCADIA-DETROIT 450HP-10 SPEED-174"WB, DIFF LOCK. SERVICED, DETAILED AND DOT INSPECTED READY FOR WORK. NICE CLEAN PRE OWNED TRUCK WITH A FACTORY 60 DAY BUYERS ASSURANCE POLICY ON THE AIR COMPRESSOR, AC, ALTERNATOR, BRAKE DRUMS, CLUTCH, DPF, EGR VALVE & COOLER, FAN CLUTCH AND HUB, STARTER, TURBO, RADIATOR AND MUCH MORE PLUS A FREE FACTORY 1YR/100K MILE WARRANTY ON THE ENGINE, TRANSMISSION AND REAR DIFFS. VERY NICE TRUCK INSIDE AND OUT LOADED UP WITH OPTIONS.